Requires a signed contract and a security deposit. The DS820A features an enhanced thermal print head and print engine system for years of trust performance. Improved heat dissipation for higher throughput. Additional print sizes including panoramic! 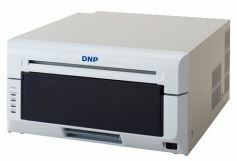 DNP Free HOT FOLDER software. Using this software, you can drag and drop the photos from the camera to the hot folder screen for immediate printing. Available for Win OS only.